While most people visit Cyprus for those gorgeous sandy beaches and the opportunity to lie in the sun, there is so much more to this fascinating country. Getting away from the main tourist attractions like the cities of Paphos and Limassol, some fascinating destinations offer so much more to the tourist, including finding out more about the country, its inhabitants and their history. While enjoying a luxurious holiday break through Cyplon Holidays, it is possible to take oneself off the main tourist track and see some marvellous and unusual destinations. One such fascinating location is Anogyra, a traditional Cypriot village located between Limassol and Paphos. The village can be found on the southern slopes of the Troodos massif, nestling among the vineyards out in the countryside, but also offers an amazing view of the bay of Pissouri below. 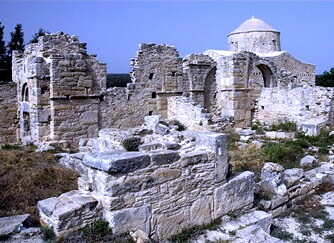 Close by are the ruins of a monastery known as Timiou Stavrou (pictured left) which has one of many ancient pierced monoliths found in Cyprus, thought to have once been used in the olive presses of time gone by. The village used to be well known in the carob trade and there is a museum offering information about carobs and their importance to the economy of both the village and the island of Cyprus itself. Exploring Anogyra, one will see the original cobbled streets and many of the traditional houses in the village have been beautifully restored. On the outskirts of the village, visit the Oleastro Olive Park to watch the process of the creation of olive oil. Those with a love for wine can visit a local winery for wine tasting and learn more of the history of the grape in the area. 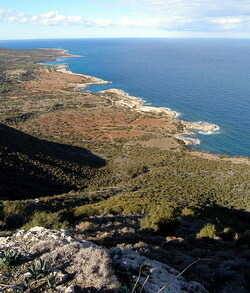 Another interesting location, situated northwest of Paphos, is the Akamas peninsula. This is a natural wilderness, ideal for hiking and walking and for those who enjoy botany or ornithology. 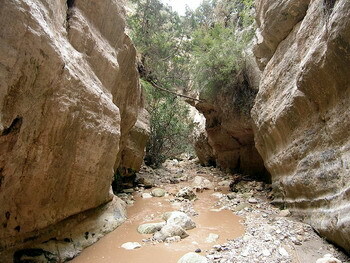 However, one really fascinating aspect of this area is the Avakas gorge. This spectacular gorge is situated just behind the beach at Toxeftra and can be easily accessed via a dirt track through the citrus plantations. Inside this gorge, it seems like a different world. Silence is only broken by the sound of a stream trickling nearby and the faraway goat bells above. While the gorge sees little sunlight, small maidenhair ferns and cyclamen plants flourish in the shade on the rocky ledges. Avakas gorge - photo CC-by-SA China Crisis This spectacular gorge heads inland for around 4.5 kilometers and has a pathway, leading upwards to the vineyards near Pano Arodhes. The sight of the wild flowers and the sound of birdsong in the area will thrill many a nature lover. Other attractions in the area include the town of Pegeia, at the southern end of the peninsula, and Polis on the northeastern side, where tourists van visit a loggerhead turtle sanctuary as well as the Baths of Aphrodite, where the goddess is thought to have bathed in the past. For nature lovers, bird watching enthusiasts and hikers, there are many wonderful locations to be found in this fascinating country.